In this busy new age, most of us are married to PCs and find it awfully excruciating if a malware strikes your system. Looking for an antivirus software for your PCs that won’t cost you an arm and leg and offers commendable anti-virus protection ? 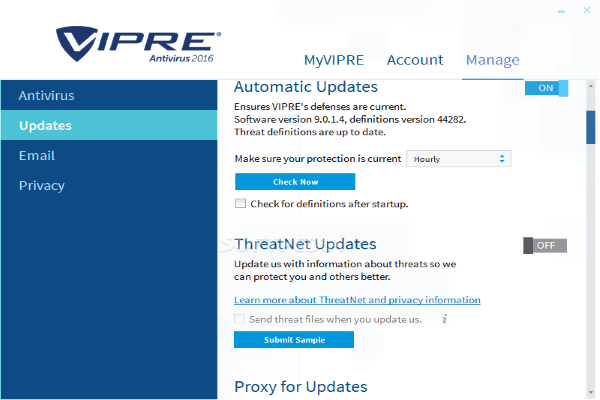 Then you may need to take a quick glance at VIPRE Antivirus 2016. 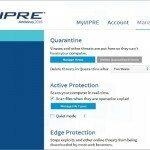 VIPRE Antivirus 2016 is decent software with many useful features to protect your PC . User may opt for either VIPRE for home or VIPRE for business and go for free 30 days trial. 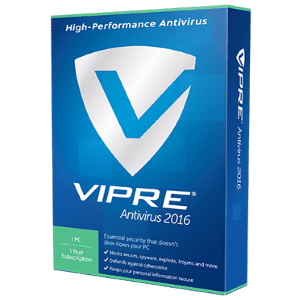 VIPER antivirus 2016 package offers features like removal of viruses and other PC infection, free 24/7 fortification from malwares and an amiable technical support. Installation and set up cannot be easier – user just need to input registration key and click on agree option, Vipre will update to the latest virus definition during installing and no Reboot needed. VIPRE antivirus brings to table efficient antivirus and anti-spyware technologies coupled with cutting-edge security aspects to offer you peace of mind. VIPRE comes with a good design and UI interface which helps users to manage it effortlessly easily select or schedule scans, test for latest updates etc. One of the good feature is Auto Patch – Vulnerable software is often touted as the the most common cause of virus infections. 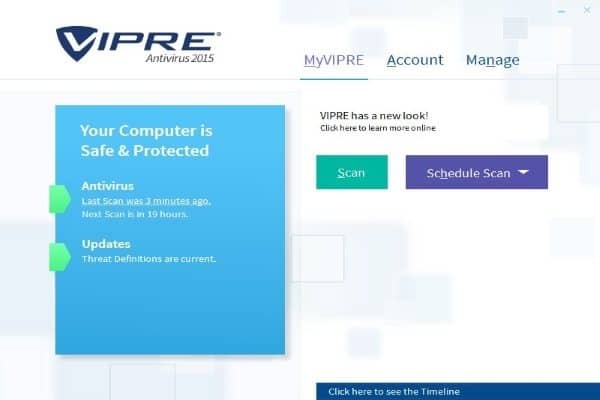 VIPRE updates antivirus programs on your system automatically to save you from the clutches of virus infected programs.Add to that VIPRE antivirus will Identifies and deactivates threats that achieves unauthorized access and inters mysterious within your system. Moreover VIPRE cleans browsing and search histories. In our testing process we found that complete scan of my system took almost one hour – it rather progressed in a snail-pace manner compared to its peers like Avast Pro or ESET NOD32. Nevertheless, in the second round of scanning, it gathered momentum and identified viruses in short span of time. 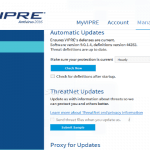 VIPRE was able to automatically blocks social networking sites/links, VIPRE antivirus checks for bad links that could infect your system with viruses or endanger you and your networks to similar threats. VIPRE real-time protection, memory usage was less than 3.5MB Ram on windows 10 testing machine, the Memory usage slightly increased when the antivirus had to deal with infected file or scan. 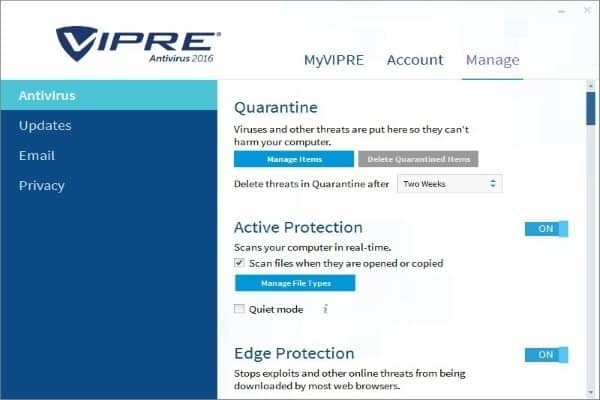 VIPRE antivirus is quickly making a name for itself on PC and mobile as one of the best antivirus programs – features like Anti-Rootkit Technology , Real-Time Monitoring and Protection and secure file eraser are sure to take it a whole new level. If you could pardon its slow pace of virus scan, it is a good antivirus program to consider.